In today’s post, we’ll answer those questions and more about this handy piece of fire protection equipment. With proper care and maintenance, fire extinguishers can be used at between 10 to 12 years. Once they get to that age, a professional should check their hydrostatic to see the durability of the shell. If it’s still holding up well even under extreme pressure, you have the option to recharge the canister so you can still use it for one or two more years. If the canister of the extinguisher is gradually losing pressure, it’s time to get a replacement. Also, if you see visible cracks on the nozzle or hose, if the handle is apparently broken, or if the shell is damaged it means the equipment may be clogged, making it unreliable. Make sure that the inspection tag is intact, if it’s missing, you will have no idea when the last routine maintenance occurred or what the state of the canister is. And when it comes to fire extinguishers, it’s critical to know these things; you’re basing the replacement schedule on that information. During a hydrostatic test, if your fire extinguisher fails it, it means it wouldn’t be able to withstand high pressures. Lastly, you know it’s time to replace your fire extinguisher if it’s been at your property for more than 12 years. If you’re unsure about the reliability and safety of your fire extinguisher, call a professional to get it properly inspected. A professional can recharge or replace it based on its condition. Whether you need to replace or recharge your unit will depend on its age and condition. If it’s relatively new, say, less than half a decade old, you may opt to recharge it. However, replacing the unit is always a good option since it usually costs the same as having it recharged. How do you properly maintain it? An extinguisher won’t run properly unless it has a pressure greater than the atmosphere around it. Do a monthly check of the gauge and inspect it for any sudden drops. The unit’s manual should tell you how to check for drops properly. If there is low pressure, replace the unit. However, if it’s rechargeable, contact your fire extinguisher provider and have it recharged. Aside from the annual inspection, hydrotesting should be done every 12 years. This test will inspect for any degradation and cracks around the shell of the fire extinguisher. Hydrotesting fire extinguishers will also determine whether your existing extinguishers are still fit to run. Aside from this type of testing, you should also check for any punctures, dents, and corrosions along the shell. The head and nozzle shouldn’t have any cracking or chipping. If there are any signs of exterior damage, replace the unit right away. Since this piece of equipment is essential to keep you and your property safe, it’s important to keep them well maintained. 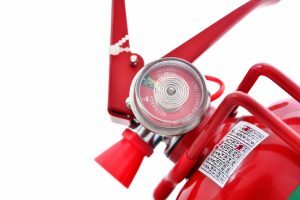 Fire protection technicians can help you properly maintain fire extinguishers. How should I dispose of it? If your fire extinguishers are not in good condition anymore, throwing them in the garbage can like regular trash is not the way to go. Since this fire protection equipment contains pressurized chemicals, it should be handled appropriately; mishandling will lead to hazardous results. Thus, you should take the time to dispose of the canisters correctly. For fully or not fully charged fire extinguishers, get in touch with your local fire department to check if you can bring the expired extinguishers to them. If they do not accept expired canisters, check where the nearest hazardous waste disposal facility is and take them there. On the other hand, if you’re trying to dispose of empty fire extinguishers, check the lever by squeezing it to ensure that all the pressure has been completely discharged. Take off the head of the fire extinguisher to make it evident that the canister has been emptied. Get in touch with your local recycling facility to check if you can drop off the shell.